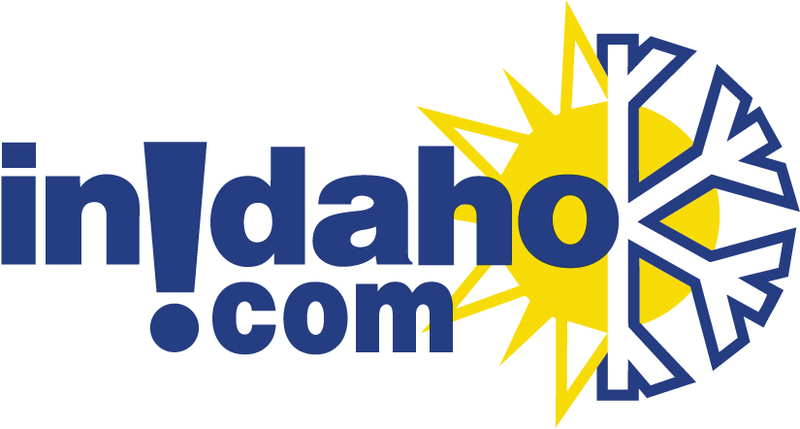 Our best package deals with lodging are through InIdaho.com! 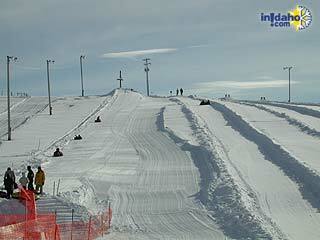 Snow tubing is one of the fastest growing winter sports in America. Everyone can do it! There are no lessons needed, expensive equipment and no need to schedule a time. We provide specially made tubes that give you a cushioned ride as you race down the mountain. The Activity barn is also lit so you can enjoy activities into the night! A specially designed cable-tow lift hooks onto the tube. Guests sit in the tube for a two and one-half minute ride to the top. There, below you, are four runs, each sculpted into a miniature half-pipe that controls the direction of the tube. The tubing hill is almost 700 feet long with a vertical drop of 85' with 4 levels of difficulty. General Location: 2 miles south of McCall. Directions: From Downtown McCall: Go south on Highway 55 to the stoplight at Deinhard Lane. Take a right (west) on Deinhard and go half a mile to Mission Street. Take a left (south) on Mission. Continue south for 1.6 miles until you reach Moonridge Road. Take a right on Moonridge and continue .6 miles. The Activity Barn is on your left. Please watch for pedestrians and cross-country skiers as you approach. 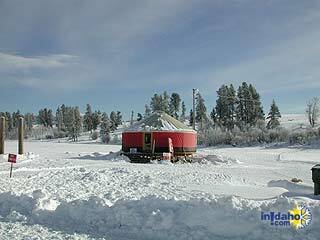 We do not have any current pre-built packages for Activity Barn Snow Tubing . Our magic carpet will take you up the hill effortlessly, just place your feet hip width apart and hold on to the handle of your tube. Once our trained staff has directed you off the lift at the top of the hill it is smooth sailing! No experience is needed, just hop in your tube and enjoy the ride. Children must be at least 36" tall and able to pull their own tube. All children should be accompanied by an adult. This is important, as most children will need assistance at the bottom of the hill - getting out of the tube, walking safely and in a timely manner away from the lanes, and in the right direction of the tube lift. If your child will be tubing under the supervision of another adult, you'll want to fill out their liability form in advance using our online system. 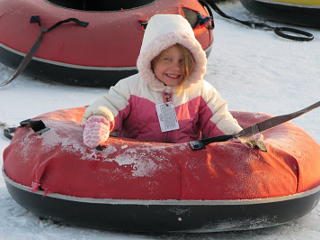 All tubing tickets include a tube rental. Tubes are designed for easy attachment to the lift. No private tubes are allowed at the tubing hill. One person per tube (including children). Tube pass allows access to up to 4 different runs each with its own personality and level of difficulty (depending on conditions). Please note: Guest reviews may mention certain amenities that may no longer be offered with Activity Barn Snow Tubing. Please check the amenities prior to booking to confirm. "Fantastic staff!! They made sure we had a good time." "We had a great time tubing. The price is a little high for just an hour of tubing, especially for a family of six but we did enjoy our time! 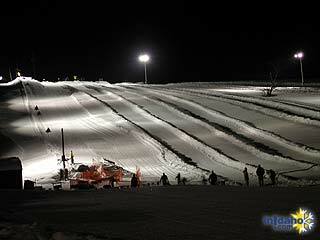 The runs were fun, staff friendly and the magic carpet ran very smooth. " "Our family had a great time. We only had purchased five passes since one family member has MS but they offered that person a free ride just to make sure all was well. That was very thoughtful. Also when asked to take a family picture for us the gentleman in the refreshment stand said not a problem at all. Little things like that mean a lot to a family spending that kind of money. Thank you! " "Exceptionally fun for the whole family - allowing the grandparents to play with the grandchildren and their parents as a family. 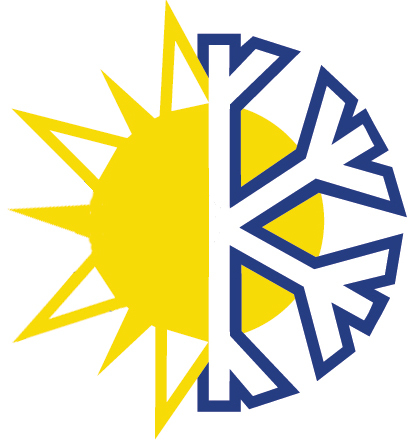 Very enjoyable and a great family experience "
Cancellation Policy**:(May vary with special rates, packages & online bookings) Tubing Passes purchased through a package have a 48-hour cancellation policy with it being non-refundable and non-changeable.